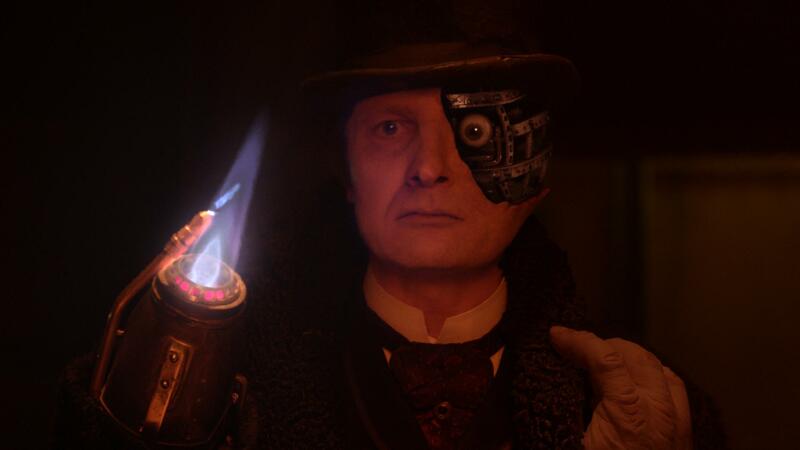 Creating the visual effects for global simulcast and cinema release of “Deep Breath” Peter Capaldi’s debut episode as Doctor Who, directed by Ben Wheatley for the eighth series of the BBC’s Doctor Who. The focus of Milk’s work was the sinister and mysterious “Half-Face Man” – the principal villain – who appears throughout the episode. Milk replaced one entire side of the actor Peter Ferdinando’s head in 87 of the 117 digital shots produced by Milk. Milk created the CG hollow cage-like structure which makes up the missing half of Half-Face Man’s head as well as the visible internal workings of his head which resemble the mechanics of a clock, with moving cogs, pistons and rotating mechanical parts. Milk designed and created the T- Rex in the opening sequence. The brief included ensuring the T-Rex was the same height as Big Ben in order to create a dramatic opening moment for this episode as the camera pans round to reveal that the dinosaur is in central London. Milk created a Victorian London cityscape which included CG builds of the Houses of Parliament, Big Ben and St Pauls as well as wide fly-over views of the Thames as the episode reaches its climax. What were the most groundbreaking or complex sequences? The most groundbreaking and complex sequences were the ones that involved the “Half-Face man”. He appeared throughout the episode necessitating a high shot count with face replacement required for the majority of his appearances. The high quality required for the cinema release of this episode had to be achieved on a TV budget, which added to the challenge. The tracking of the face replacement required extreme precision by Milk’s match move team lead by Amy Felce. To assist with this critical element we took a 360 degree photo scan of actor Peter Ferdinando’s head and subsequently created a highly accurate 3D model of his head. This mesh then helped our tracking team to lock-in reference points to his natural head shape. The actor also had prosthetic make-up masking the missing side of his head. This helped two fold as it gave us more tracking information and for very wide shots it allowed the shot to be graded down into shadow. 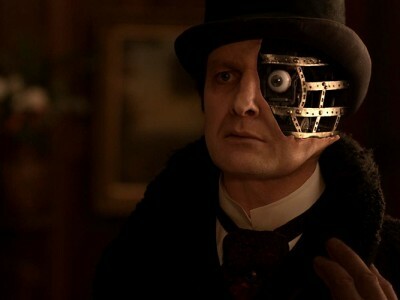 The character’s costume included a top hat to which we added tracking markers as well as to the bridge of his nose and the centre of his forehead. This allowed us to accurately matchmove all the rotations and translations of the head.Once we had tracked the movements of the head we were able to line up the accurate 3D model to the live action head. In addition, a full-scale physical model was also built for use on set both for a small number of shots and as lighting reference for us. The asset build for the internal workings of the Half-Face man’s face involved creating CG cogs and pistons for which we built a fully automated rigging system. Each shot was then animated to add movement and detail to the mechanism as well as animate and line up the CG eye with the actor’s natural eye-line and movement. 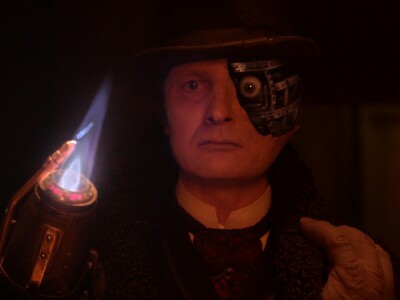 It was essential to light Half-Face Man’s CG face absolutely accurately – matching it perfectly to the on set lighting environment in order to ensure the complete believability and consistency of the character throughout the episode. In order to achieve this we photo-scanned all the different environments he appeared in. This provided our lighting and rendering team lead by Darren Byford with a virtual set in which to work. Combined with the reference from the practical dummy and high-resolution photo reference we were able to gather a wealth of information to work with. Ahead of the compositing process our roto prep team had the monumental task of cleaning up all the tracking markers, removing the prosthetic make up, creating a hollow head, and finally building up the missing bits of his hat and collar. This had to be done on every single shot. The compositing team then worked in each environment to finalise the look and accuracy of Half-Face man’s CG head. The most exciting challenge was realising the Half-Face man, not least because of the sheer number of shots (87) we were working with. We heavily relied upon all aspects of Milk’s pipeline in order to successfully achieve a photo-real look that allowed the audience to totally engage with the character. Creating a believable human main character with half a CG face is always challenging, however director Ben Wheatley made it a hugely enjoyable collaboration. He worked very closely with us to enable us to achieve work that we are very proud of.